The Lodge cast iron griddle is another offering from the American-based Lodge company. This double sided grill-griddle is perfect to take camping or to use on your barbecue or stovetop to make breakfast in the morning and hamburgers and steaks at night. Use it in the afternoon for a lunch of grilled cheese sandwiches. You can also throw it under the broiler for great broiled steaks, ribs and fish. It truly is versatile. The Lodge cast iron griddle provides fast, even heating that gives a nice brown surface to pancakes, meat and other foods. It comes pre-seasoned, so you can use it right out of the box. The smooth griddle is perfect for cooking hash browns or pancakes, while the raised-rib side makes perfect grill marks on your steaks, fish and hamburgers. With repeated use, the seasoning creates a truly safe, nonstick pan. You can have two different heats going by keeping one burner on a higher temperature and one on a lower heat. This allows you to cook on one end and keep food warm on the other. Cleaning is easy? just wipe away the grease and food residue with a paper towel. The Lodge cast iron griddle is heavy; after all, it is made of cast iron. And while its large size is great while cooking, it doesn't fit in the sink very well. If you want to use it in your oven, measure first, since not all ovens are large enough to accommodate this griddle. When you cook bacon, there are no sides to keep the spattering grease contained. While this isn't much of a problem when you're cooking on a campfire, on your stove it may be a different matter. The griddle flips over to reveal a grill that heats fast and evenly. A built-in slight slope directs grease into a gutter to get it out of the way. Easy grip handles on each end makes it easy to move. This griddle comes pre-seasoned and ready to use. The griddle measures 20 x 10-7/16 inches. All in all, the Lodge Logic Pro 20-by-10-7/16-Inch Cast-Iron Grill/Griddle works well in most instances. It is heavy, but the cast iron heats evenly and cooks well. It does require special care, as does all cast iron cookware. 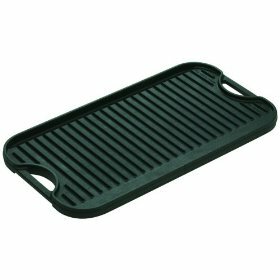 This griddle can be used on the stove, the oven, the barbecue or the campfire and is reversible, giving you both a griddle and a grill surface. This allows you to cook a wide variety of foods easily.